Phil Taylor came from 5-1 down to draw 6-6 with Michael van Gerwen in Glasgow, leaving the pair level on points at the top of the Premier League table. 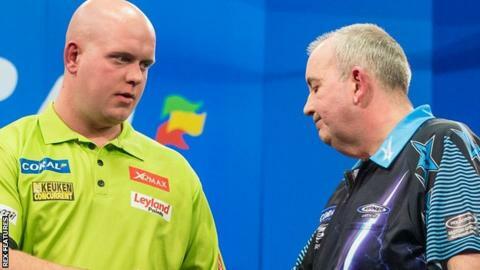 Van Gerwen hit a 170 checkout to lead 6-4, but 16-time world champion Taylor won the final two legs to earn a point. Defending champion Gary Anderson is third, a point behind the pair, after beating Adrian Lewis and Peter Wright. Scotland's Anderson played twice on Thursday, having missed the opening week's matches because of illness. Raymond van Barneveld and James Wade were also victorious, denting the qualification hopes of Dave Chisnall and Robert Thornton. Only two more rounds of fixtures remain before the 10-man field is cut to eight players for the second phase of the group stage. Thornton and Michael Smith, who was not in action in Glasgow after playing twice in Leeds last month to cover for Anderson's absence, occupy the bottom two places in the table. The greatest night in darts history?